Did you know that April 26th is National Paper Airplane Day? While it is only an unofficial observance in the United States, paper airplane celebrations happen all over the country to commemorate this simple aeronautical toy. After all, who hasn’t made a paper airplane at some point in their life? To do our part, we would like to encourage all of our Fly.com friends to revisit this old past time. And to make it worth your while we are holding a paper airplane competition. The winner will get a set of swanky American Tourister luggage (worth $200) and the two runners-up will receive Visa gift cards to go toward their next travel experience. How will this competition work, we hear you ask? Well, typically paper airplane contests focus on two basic categories: “distance” and “time in air”. But given that this is an online competition, we thought we would do something a little different. We would like to see your actual airplane designs instead! All you have to do is go to the Fly.com Facebook page and “Like” us. Then email your airplane photo to competitions@fly.com by April 20th. It is that simple. The finalists will be selected by the Fly.com team and posted on our Facebook page on April 26th. It will then be up to our Facebook followers to vote for their favorites by “liking” your photo submission. (HINT: Make sure you get your family and friends “like” your airplane too). So what are you waiting for? Go find some paper and dig out your coloring pens and get as creative as you like. 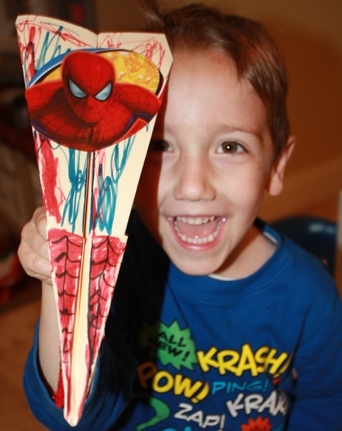 For inspiration we have shared a photo of 4 year old Keaton who designed his own paper airplane based on his favorite superhero: Spiderman! To learn more about out how to enter, visit the Fly.com Facebook page. Minor correction: May 26, not April 26.